i am still as busy as ever - cooking non-stop in preparation for my first cookbook (woop woop!) and just generally preparing for france shortly and australia next month. isn't it funny how life is such a roller coaster, with long quiet periods and very busy ones in between? i'm thankful for the combination, because if life were like quiet or busy all the time i think i'd go a little crazy. 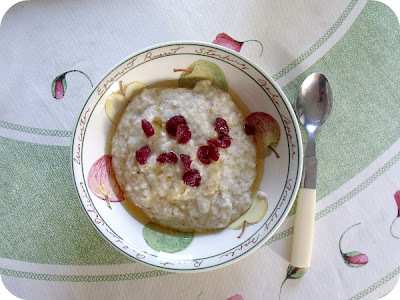 ♥ coconut porridge -a happy new favorite. very low in carbs, yet high in fibre and good fats! topped with a few cranberries and some honey, this was scrumptious. ♥ then off to another friend's for lunch the following day, where she kindly prepared me a tasty tuna avocado salad - it's such a pleasure when other people are happy to cook for me. emily was delighted to come up with a recipe that she wouldn't normally eat, but that tasted really delicious... and she tucked into a salad bowl just as full! ♥ it's a really neat little idea of a book actually - with tips on local foods, restaurants, lifestyle, markets, food related tours and museums, and of course, recipes! next time i'm taking a city break i'll probably be picking it up to see what the foodie suggestions are. the pictures are gorgeous, and it would be a great book for anyone thinking of coming to europe, as it does give a really good sense of what europe is like, and how important the food is to each culture. i've not cooked any of the recipes yet, but they are really more of an addition to the book, rather than it's main focus, which is a shame. but from reading through i've learnt all about the artichoke festival in iria, the pork specialities in the restaurant majore in sicily and falmouth oyster festival - where else would i find out about those? it's also handily got the time zone, currency, telephone code, capital and spoken languages listed with each country. and some countries have their regions separated also, so you can find slightly more detailed info. because this book was sent for me to review, the wonderful company are offering a discount code * to my readers (how nice!) - so if you want to take advantage, all you have to do is enter the discount code Apples at the checkout on the New Holland website, and you'll get 25% off the regular book price, plus free P&P! * this discount code is eligible until 30th September 2011, to all UK residents, and cannot be used in conjunction with any other offer. Coconut porridge looks so neat! I've never heard of that...you need to post the recipe! I love coconut in porridge, especially when topped with some nectar sweet fresh ripe mango, mmm!